Blocking the renin-angiotensin system (RAS) would be expected to lower not only BP but also the leakage of proteins into the urinary space. Previous analyses of the Ramipril Efficacy in Nephropathy (REIN) study, Reduction of Endpoints in NIDDM with the Angiotensin II Antagonist Losartan (RENAAL) study, and Irbesartan Diabetic Nephropathy Trial (IDNT) indicated that albuminuria is a major renal risk factor in patients with nephropathy and that the degree of short-term albuminuria reduction under treatment is important in terms of long-term clinical outcome (1–6). However, these publications neither elaborated on the potential disparity between the BP and anti-albuminuric responses in individual patients nor reported on the effect that such a differential intraindividual response would have on renal outcome. It could be argued that an exclusively BP-driven titration may not be the most efficacious treatment strategy because the level of albuminuria, as an independent risk factor for renal disease, is not always concordant with the change in BP (7). It is possible that pharmacologic intervention that is concurrently aimed at reducing BP as well as albuminuria could result in additional clinical benefit beyond that achieved with BP lowering alone. The association between the albuminuric response and clinical outcome across various levels of BP response has not been investigated, although a clinically relevant issue would relate to whether hypertensive patients with diabetic nephropathy would benefit from albuminuria reduction even when the currently recommended systolic BP (SBP) target is achieved (SBP <130 mmHg). In an attempt to explore further the relationship between changes in BP and albuminuria on the one hand and renal morbidity on the other hand, we performed a detailed post hoc analysis in hypertensive patients with diabetic nephropathy from the RENAAL study. 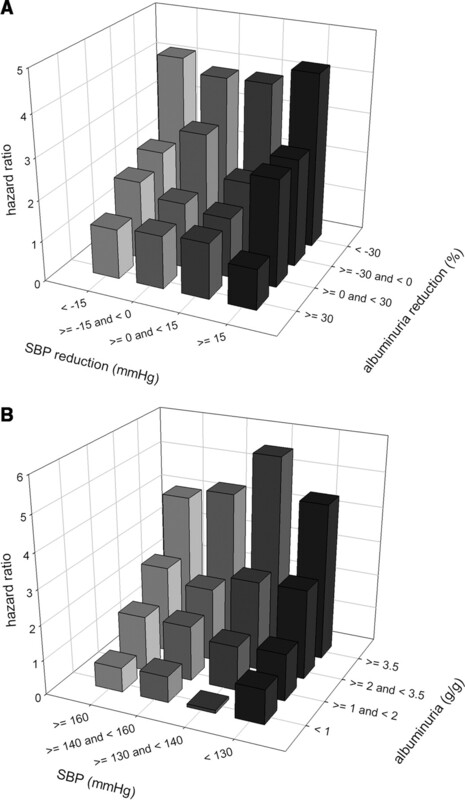 First, we investigated the extent of discordance in treatment effects on SBP and albuminuria to describe the potential clinical importance of this issue. Second, we examined the association between differential BP and anti-albuminuric responses and renal outcome. Ultimately, this should lead to answering the question as to whether albuminuria reduction should be a treatment target in addition to the commonly pursued target of BP reduction in hypertensive patients with diabetic nephropathy. The RENAAL study was a double-blind, randomized, placebo-controlled study that was designed to evaluate the renoprotective effects of a losartan-based antihypertensive regimen compared with a traditional BP-lowering regimen in patients with hypertension, type 2 diabetes, and nephropathy (8). During the 6-wk screening phase, patients with hypertension continued to receive their standard antihypertensive therapy. If they had been taking angiotensin I–converting enzyme (ACE) inhibitors or angiotensin II receptor blockers (ARB), however, then these medications were discontinued and replaced by alternative open-label medications, such as diuretics, calcium channel antagonists, or β blockers. Patients were stratified according to their baseline level of albuminuria (a urinary albumin-to-creatinine ratio <2000 or ≥2000) and randomly assigned to receive either losartan 50 mg or placebo once daily, along with conventional antihypertensive therapy. After 4 wk, the dosage of losartan or placebo was increased to 100 mg once daily or placebo-equivalent dosage if the trough BP was above the target of 140/90 mmHg. After an additional 8 wk, antihypertensive agents of the types described (but not ACE inhibitors or ARB) were added or the dosage of these agents increased to achieve the target BP. On average, patients used four antihypertensive medications during the study. Fewer than 10% of patients discontinued the study drug during the first 6 mo. ESRD was a prespecified end point in the RENAAL study, which was defined as the need for long-term dialysis or renal transplantation. Information on the clinical end points was collected during a mean follow-up duration of 3.4 yr with the range of 2.3 to 4.6 yr. More detailed information on the study protocol and the main study outcome has been described elsewhere (8,9). This study was conducted with adherence to the Declaration of Helsinki. All patients provided signed informed consent. The protocol was approved by all relevant ethics committees. This analysis focuses on SBP and albuminuria. Measurements of BP were obtained at baseline and after 1 wk, 1 mo, and every 3 mo after randomization for the duration of the study. Albuminuria was assessed using the ratio of albumin (g/L) to creatinine (g/L) concentrations from a first-morning-void urine sample. Urine samples for the determination of albuminuria were collected at baseline and every 3 mo after randomization for the duration of the study. Postrandomization BP and albuminuria were determined by a prespecified time window around each scheduled visit. Both the measurement of BP and the collection of the urine sample for albuminuria were required to be performed within 1 d to obtain matched values for BP and albuminuria. In line with previous work, the 6-mo time window for treatment-induced changes in the specified variables was chosen for several reasons (1). First, this was the earliest time point at which most variables of interest were available. Second, the treatment effect was considered already present at this time. Third, few events occurred before month 6. The reduction in SBP was calculated as the value obtained at baseline minus month 6, and the proportional albuminuria reduction was calculated as 100% × (1 − ratio of albuminuria at month 6/baseline). The residual levels of SBP or albuminuria were the corresponding values at month 6. All eligible patients as originally randomly assigned to treatments with SBP and albuminuria data at both baseline and month 6 were included in the analysis. For patients who had a missing value of either SBP or albuminuria at month 6, the last observed postrandomization value was used. We explored the association of the reductions in SBP and albuminuria from baseline to month 6 with the risk for ESRD. The reduction in SBP was stratified by four categories: <−15, −15 to 0, 0 to 15, and ≥15 mmHg. The albuminuria reduction was stratified by four categories: <−30, −30 to 0, 0 to 30, and ≥30%. In an additional analysis, the association of the residual level of SBP and albuminuria at month 6 with the risk for ESRD was explored. The residual in SBP was stratified by four categories: <130, 130 to 140, 140 to 160, and ≥160 mmHg. The residual in albuminuria was stratified by four categories: <1, 1 to 2, 2 to 3.5, and ≥3.5 g/g. The categories were chosen post hoc, with the aim of providing easily understandable thresholds and approximately equal sample sizes and number of events for each subgroup. Similar stratification for proportional albuminuria reduction was used in previous publications (1,2). For exploration of the hazard risk profile, category factors for SBP and/or albuminuria (either for reduction or residual) were used in a multivariate Cox model with the last category of the corresponding factor as a common reference to compute the hazard ratio and 95% confidence interval for the remainder of the categories. For testing of combined effects of reductions in SBP and albuminuria, interaction terms were added to the model. Treatment groups were treated as strata in the model to remove potential confounding as a result of study treatment allocation. The analysis was also adjusted for baseline covariates, including age, gender, race, body mass index, smoking, previous antihypertensive therapies (including α blocker, β blocker, dihydropyridine calcium channel blocker, nondihydropyridine calcium channel blocker, ACE inhibitor, or ARB), duration of hypertension (< or ≥10 yr), cardiovascular disease history, serum creatinine, serum albumin, hemoglobin, total cholesterol, triglycerides on the natural scale, glucose, SBP, diastolic BP, and urine albumin/creatinine ratio on the natural scale. The backward selection method was used for selection of covariates for the final adjusted analyses (α = 0.01). On the basis of results of univariate analysis and previous work (9,10), the baseline covariates serum creatinine, serum albumin, hemoglobin, and urine albumin/creatinine ratio on the natural scale were forced into the multivariate model. The number of patients, number of events, and number of events per 1000 patient-years of follow-up were provided by category. Patient counts and percentages were also given by combined SBP and albuminuria reduction categories for each treatment group (losartan or placebo). Patient characteristics, BP, and laboratory parameters at baseline were summarized for combinations of SBP and albuminuria reduction categories. Means and SD were provided for continuous variables, whereas numbers of patients and percentages were provided for class variables. The statistical package SAS version 8 was used for this analysis (SAS Institute, Cary, NC). A total of 1428 of the 1513 patients in the RENAAL study had baseline and up to month 6 SBP and albuminuria data available for this analysis, a substantial number of whom reached the predefined BP target within these 6 mo (414 [29%] of 1428). A total of 452 patients showed a reduction in SBP in the losartan group, 117 (26%) of whom had no reduction in albuminuria (Table 1). Similarly, a total of 386 patients showed a reduction in SBP in the placebo group, 195 (51%) of whom had no reduction in albuminuria. Altogether, 335 (47%) of 715 losartan-treated patients experienced a reduction in both SBP and albuminuria, whereas 105 (15%) of 715 losartan-treated patients did not exhibit a reduction of either parameter. Thus, 275 (38%) of 715 losartan-treated patients had a response to one parameter but not the other. Scatter plots of SBP and albuminuria response in individual patients are presented in Figure 1, showing a substantial proportion of patients with discordant effects in either treatment group. Baseline characteristics according to albuminuria and SBP response are presented in Table 2. The mean baseline level of SBP and/or albuminuria was higher in those who experienced a reduction in SBP and/or albuminuria, respectively. Other parameters were comparable across the four categories. 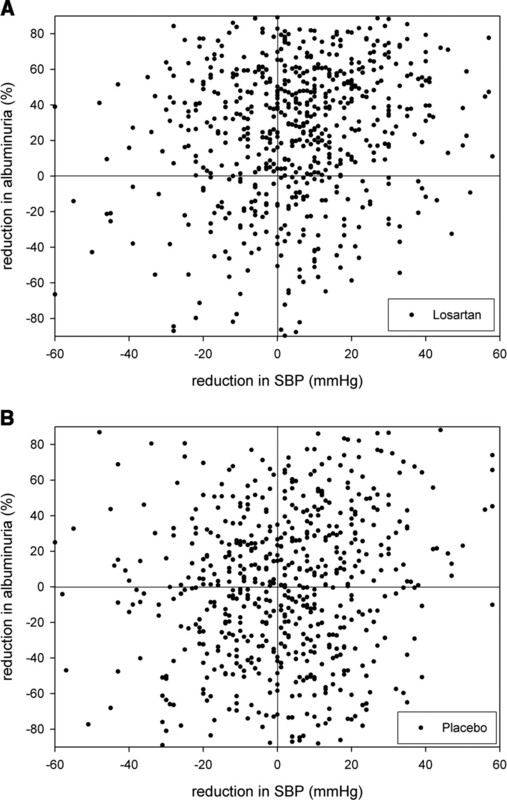 (A) Scatter plot of systolic BP (SBP) versus albuminuria response in individual losartan-treated patients. (B) Scatter plot of SBP versus albuminuria response in individual placebo-treated patients. The relationship of ESRD and SBP reduction at month 6 is presented in Table 3. Patients with a lesser reduction in SBP compared with the reference group with a reduction in SBP ≥15 mmHg showed an increased risk for ESRD as reflected in progressively higher hazard ratios. A similar pattern was observed for the reduction in albuminuria, with a lesser reduction in albuminuria associated with a higher risk for ESRD (Table 3). The reduction in albuminuria was an independent predictor for ESRD, regardless of either baseline or change values in SBP (Table 4). There was no interaction of the reduction in albuminuria over reduction in SBP, which was not even significant after adjustment for other risk factors. The risk for ESRD according to combined SBP and anti-albuminuric responses after adjustment for baseline risk factors is presented in Figure 2A. The combination of a robust reduction in albuminuria and SBP resulted in the most favorable clinical outcome. The ESRD risk showed dependence on albuminuria reduction across all categories of SBP reduction, whereas the ESRD hazard ratio was comparable across SBP reduction categories within each stratum of albuminuria reduction. The presence of an SBP reduction in those who had a good anti-albuminuric response did not have much additional effect on renoprotection. An additional analysis that focused on the residual level of SBP and albuminuria after adjustment for baseline risk factors yielded results in line with the main analysis, showing a progressively lower risk for ESRD with a lower level of residual albuminuria across all categories of SBP achieved (Figure 2B). Results were consistent when separately analyzed in strata according to baseline albuminuria, baseline SBP, or treatment administered (data not shown). The baseline covariates serum albumin, albuminuria, serum creatinine, hemoglobin, total cholesterol, age, gender, race, SBP, previous dihydropyridine calcium channel blockers use, and duration of hypertension were significantly associated with the ESRD end point in the univariate analysis. (A) ESRD risk by SBP and albuminuria reduction. (B) ESRD risk by residual SBP and albuminuria level. Our analysis indicates that a reduction in either albuminuria or SBP is of importance in terms of renal outcome and that the combination of a reduction in both albuminuria and SBP results in the most favorable clinical outcome in hypertensive patients with diabetic nephropathy. However, a substantial number of patients had no reduction in albuminuria in conjunction with reduced SBP or vice versa. This dissociation of antihypertensive and anti-albuminuric responses was apparent regardless of whether losartan or placebo was administered in addition to conventional antihypertensive medication. Importantly, even with albuminuria-lowering medication such as losartan, nearly 40% of the patients had a dissociation of antihypertensive and anti-albuminuric responses. These findings raise the issue as to whether physicians should routinely monitor not only the BP response but also the anti-albuminuric response in hypertensive patients with diabetic nephropathy and adjust the medications accordingly to provide both SBP and albuminuria reduction. This analysis demonstrates that the risk for ESRD has a clear dependence on the anti-albuminuric response. A larger albuminuria reduction was associated with a more favorable renal outcome, regardless of the SBP change during treatment (Figure 2A). It is intriguing that one offers improved renal protection to patients with diabetic nephropathy when one lowers albuminuria, even when the BP of the individual remains unchanged or rises. In fact, the hazard ratio for ESRD seemed to be largely independent of treatment-induced SBP changes within the various strata of albuminuria reduction. An additional analysis regarding the residual level of SBP and albuminuria yielded results in agreement with these findings, showing a progressively lower ESRD risk with a lower level of residual albuminuria independent from the level of SBP achieved (Figure 2B). Importantly, this was also observed in patients who reached the current SBP target for patients with diabetes (SBP <130 mmHg). These data indicate that an exclusively BP-driven titration of treatment to improve renal outcomes may not be the most efficacious strategy in hypertensive patients with diabetic nephropathy. The data challenge the conclusions from a recently published meta-analysis by Casas et al. (11) stating that the improved renal outcomes with ACE inhibitors or ARB in placebo-controlled trials probably result from a BP-lowering effect only. Thus, the anti-albuminuric response could be an important driver of therapeutic success within a given antihypertensive regimen and achievement of a certain SBP goal, whereas a reduced level of albuminuria should not be assessed to occur universally in hypertensive patients who respond with a lowered BP to RAS-inhibiting treatment. This relatively new concept obviously needs further confirmation in a prospective trial with an albuminuria-based titration of pharmacologic treatment, aimed at establishing a causal relationship between albuminuria reduction and improved renal outcome. The possibility exists that a good anti-albuminuric response may represent an improved 24-h BP control. Our post hoc analysis relates to a study that was not primarily aimed to investigate the dependence of renal outcome on various levels of BP-lowering and anti-albuminuric responses. Nevertheless, there is accumulating evidence to support the view that albuminuria reduction is an important therapeutic goal. Previously, relevant findings were derived from a pooled analysis of the second Ramipril Efficacy in Nephropathy (REIN-2) study, the African American Study of Kidney Disease and Hypertension (AASK), the Modification of Diet in Renal Disease (MDRD) study, and a study by Lewis et al. (12–15) in patients with diabetic and nondiabetic albuminuric nephropathies. These trials of intensified BP control showed that more effective RAS inhibition, rather than more effective BP reduction, was the key component of the intensified treatment strategies that was responsible for conferring maximal renoprotection. Our data support these previous findings because albuminuria reduction generally requires interruption of the RAS coupled to BP reduction, as opposed to BP reduction alone that can also be achieved via non-RAS pharmacologic approaches, including calcium antagonists and diuretics. When treatment with RAS-inhibiting therapy is initiated in a clinical setting, measurements of BP and albuminuria are easily available to the physician to titrate the pharmacologic intervention. It would be reasonable to assume that reduction of BP as well as albuminuria to the “normotensive” and “normo-albuminuric” range would suggest an effective inhibition of the RAS system in the vast majority of patients who receive ACE inhibitor and/or ARB treatment. The findings of this analysis further suggest that a RAS inhibition–based anti-albuminuric response could be considered as a therapeutic goal besides the commonly pursued strategy of BP reduction. Apparently, it does not suffice to initiate RAS intervention with titration solely directed to reducing BP, because many patients have an insufficient concomitant anti-albuminuric response, even at the highest recommended dosage of losartan that leads to a good BP response. Alternative approaches to reduce albuminuria may therefore be considered, for example, by combining different RAS-inhibiting treatments through co-administration of an ACE inhibitor and an ARB (16,17). Our data show that treatment-induced changes in SBP and albuminuria do not run in parallel in a substantial proportion of patients. The risk for ESRD showed a clear dependence on albuminuria reduction, regardless of change in SBP. In agreement with this, the risk for ESRD also showed dependence on the residual level of albuminuria, even in patients who reached the current SBP target for patients with diabetes. An exclusively BP-driven titration of treatment to improve clinical outcomes may therefore not be the most efficacious strategy in hypertensive patients with diabetic nephropathy. These data support the concept that antihypertensive treatment aimed at improving renal outcomes in these patients may require a dual treatment strategy, routinely targeting a reduction in albuminuria in addition to reducing BP. The RENAAL study was funded by Merck & Co. B.M.B, M.E.C., D.d.Z., W.F.K., H.-H.P., G.R., and M.R.W. have received grant support from Merck. G.W.G., W.F.K., S.S., and Z.Z. are or have been employees of Merck and may own stock and/or hold stock options in the company. We acknowledge Paulette A. Lyle for contributions to revising the manuscript and the tremendous supportive role of all RENAAL investigators, support staff, and participating patients.